i love the look and how simple my sony reader is. i got 100 free classics on cd with it so for the time being im fine. my problem is that sometimes to buy and download a new title is seemingly more expensive than buying the actual book. the usual 12.99 or whatever the hardback version may be. i think waterstones need to sort something quickly. I have one, and it’s lovely. However Waterstones eBook site is terrible, and Sony’s Ebook store is not accessible in the UK. That’s a MAJOR problem in my opinion. The ebook pricing is also somewhat dramatically variable – you’ll pay anything from nothing at all, to more than hardback prices for the ebook. I don’t mind too much – I’m a person who’ll happily pay hardback prices just to _not_ have to carry a hefty hardback around – but am somewhat irked that I can’t then lend stuff I’ve read to friends. Thankyou Sony the ebook is fantastic. But the price of books and the waterstones ebook site will put many people off . Also does anybody think the battery life is short ? Above it says the battery needs to be changed after 7500 page turns but it is a rechargable !!!!!!!!! I wonder why those of us in Europe these products!? We’re overcharged and supplied with inferior support items! For this alone I would hesitate to suggest it to anyone else. 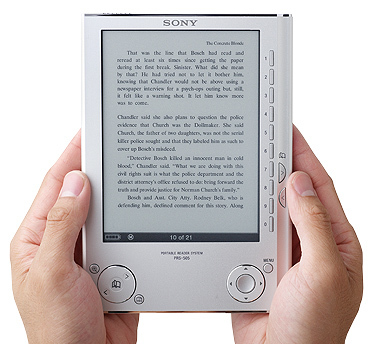 The Sony is a good device, but lacks the iPod ‘cool’ factor, and the whole ebook thing is currently severely hampered by both cost and availability of ebooks. I bought mine on impulse as a special offer from the Sony store at Heathrow Terminal 5 – £194, a saving of £30 off list. 2. Put your finger on the right hand end of the page and flick to the left to turn a page (and no flashing as the new page is drawn). 3. Use your finger to scroll rapidly through the list of 100+ titles. 4. Increase/decrease text size by moving two figures apart/together. 5. Easy navigation of music so you can adjust the sound without interrupting your reading. 6. Bigger screen area in relation to the overall size. Don’t get me wrong – it works fine, but just feels a bit plodding in its design – nothing to make you smile at the sheer imagination and inventiveness of the creators. So you won’t get your money back through savings on books. That leaves the benefit as carrying around 100+ books from a limited and rather costly selection in a single neat package. No wonder Sony has them on special offer. Has anybody found the best UK store(s) for popular fiction both in choice and price. I hope this is not Waterstones because I am less than impressed with their site and offreings. i bought this when it first came out and in the interim have been unable to download anything onto it. i have received negative response and help from both waterstones and sony, each of which try to blame Adobe. my advice, dont touch with a barge pole. This is the best gadget I must have brought till now. I purchased it for Rs.14,800 . It is so amazing, I read every day on this. I’m about to buy one of these because my local public library now lends ebooks (for nothing) – making them the cheapest book store around.